I find it’s always very difficult to review a parody. On one hand, full enjoyment of a parody comes only from knowing the source material well. On the other hand, as Airplane! and Hot Shots proved, a parody should also be able to stand on its own two feet and amuse even the casual viewer. And then there’s the fact that humor is subjective. What I find funny is obviously not what someone else finds funny so it’s difficult to base a judgment on that. Anyway, hi everybody (all two of you), sorry for the long wait, haven’t really had much to write about in a while but here you go, a review of a kaiju movie. For those of you at home scratching your head wondering what a kaiju is, it’s basically a grown man in a rubber suit stomping toy houses. Godzilla is a kaiju and so is King Kong. Pacific Rim is a perfect example of an American kaiju flick. 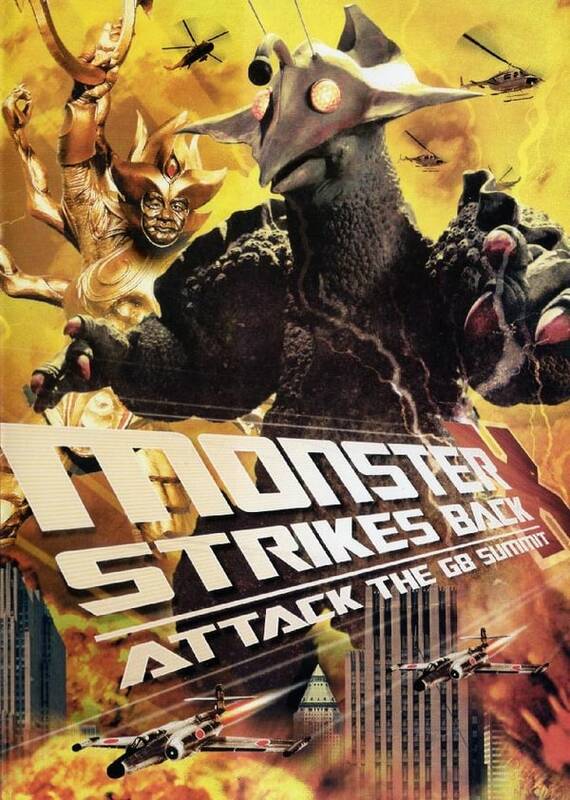 Anyway, The Monster X Strikes Back was released in 2008 and it’s been one of those movies that I just never got around to seeing. It’s a sequel to 1967’s “The X from Outer Space” but taken in a more intentionally humorous direction. Frankly, I don’t see the point of making it a parody when the original was so sidesplittingly hilarious as it was… sure, it wasn’t intentionally funny but funny none the less. This time the movie is set in modern day Japan where the most recent G8 Summit is taking place. In the middle of these meetings, a giant monster lands on Earth and begins wreaking havoc across the country. The politicians attending the summit decide that they’re the perfect leaders for this crisis and decide to take charge. At the same time we follow a reporter and her trusted cameraman as they investigate a mysterious shrine out in the middle of nowhere, not far from the summit itself. What this results in is some of the most offensive stereotyping I’ve seen in a long time but at least here it’s done intentionally. And in all fairness, no country escapes the mighty wrath of director Minoru Kawasaki, not even Japan itself. All the cultural stereotypes are played tongue in cheek and are actually based around the political intrigue of the time and history in general. At times there’s quick wit displayed referencing World War 2 and it’s obvious much of the relationship between USA and Russia plays off the Cold War. On a more political note, it’s a tool to show that all the grandstanding is entirely pointless since neither country actually manage to come up with an effective strategy against the monster, some even having comical effects such as the German’s gas being little more than laughing gas for Guilala, the giant monster. Instead we’re told to listen to the people more since they’re the ones who come up with the solution. The rest of the comedy is a mixed bag ranging from a delegate having to run to the toilet all the time, a kid showing up out of nowhere with a fitting name for the monster in true kaiju-fashion, things being inserted in rectums and Takeshi Kitano showing up as a golden God to fight off the monster. Yes, you read that right, the real centerpiece of the movie is a fight between Guilala and Take-Majin, a deity that has appeared at numerous times throughout history to save Japan from destruction. And this deity, of course, has the face of Takeshi Kitano, aka Beat Takeshi. I don’t want to spoil too much of what happens since many of the gags are one-shots only, meaning you can laugh at them once and then they sort of lose their luster. I’m fairly certain that if I ever saw it again, I’d come away liking the movie less. But I can confirm that there’s a few surprising twists along the way and an unlikely country plays the hero in the end. Can you enjoy it without knowing the source material? Yes, some of the humor is universal and you don’t have to be too politically savvy to get where the cultural stereotypes are coming from, like why the French delegate wants to shag a Japanese woman. But much of it will only appeal to kaiju fans such as myself but that’s just the nature of the beast here. Do I recommend it? If you really don’t have anything better to do then sure. It’s not brilliantly acted, it’s not brilliantly directed, it’s not really brilliant anything and it’s not worth a rewatch. But I can’t say I regret watching it or that it was any sort of waste of time. So… take that for what you want.